← Shamon to Anacapa Brewery! Greek at the Harbor – Get your Opa on! After my awesome time at the Ventura County Greek Festival, I was itching to try an authentic Greek restaurant. After careful consideration, I settled on the Greek at the Harbor, mainly because I enjoy spending time down by the beach, but also because there always seems to be a pretty good crowd eating their food. I made Mikey come along with me on this grand adventure, so we met up after work and headed down to Ventura Harbor in search of a little Opa! We got to the restaurant about 10 minutes before our 7 o’clock reservation. Wednesday nights are “wine flight” nights at the greek and they have a special section all cordoned off just for the wine drinkers. 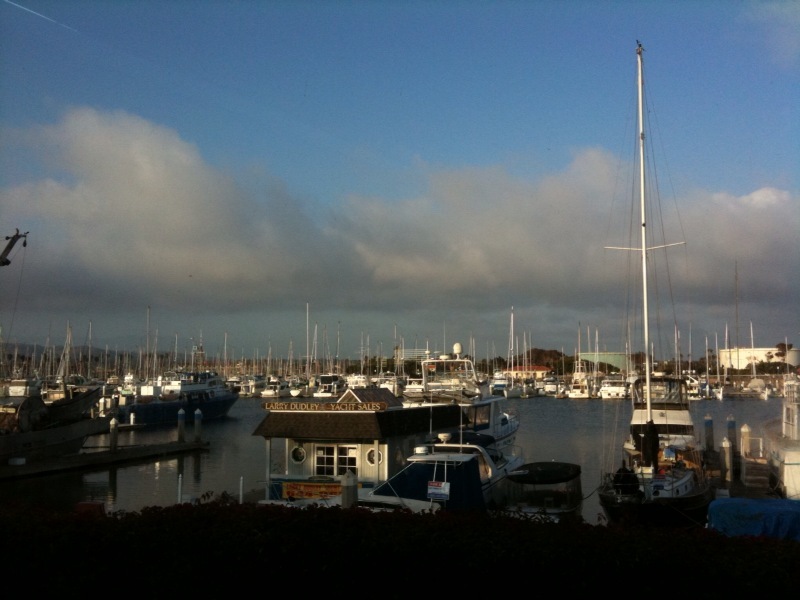 Mikey and I faked them out though and got them to seat us in the wine patio, which is where I snapped this nice little picture of the harbor view. Mikey and I didn’t end up drinking the wine, but basically, a wine “flight” is a 1/2 glass of 3 different wines. The have a red flight and a white one and accompany them with a nice little tapas menu for you to order from. Since Mike and I were looking for the quintessential Greek experience, we just ordered off the dinner menu. Just because we didn’t drink wine, doesn’t mean that we still don’t know how to party. We chose to start the night off right with a couple of Greek beers. 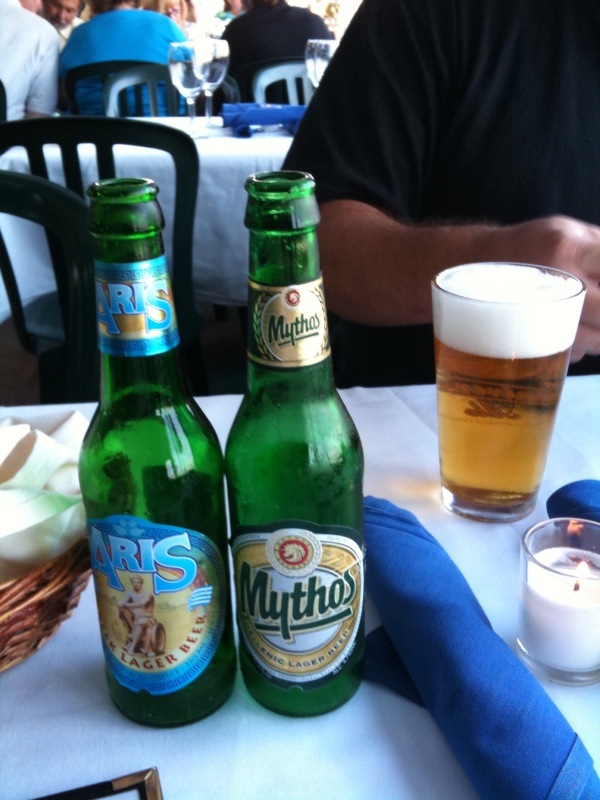 Out of the two beers, I preferred the Aris, while Mikey liked the Mythos. They are both lagers, but the Aris has a little more body and flavor. The Mythos was really light and crisp and kind of reminded me of bud light, if bud light grew up and actually became a real beer. For our meal, we decided to go for the gold and get the 5 course “Greek Feast.” I would tell you everything in it right now, but then you’d have no reason to keep reading. Since I need you guys to feed my outrageous ego, I simply can’t let that happen. Also, just a quick note, this was a long meal, and after the first two courses I didn’t have enough light to get good pics from my phone. So you’ll just have to imagine the beauty and take my word for it. I will say this, the meal’s beginning and end were, far and away, the best parts for me. 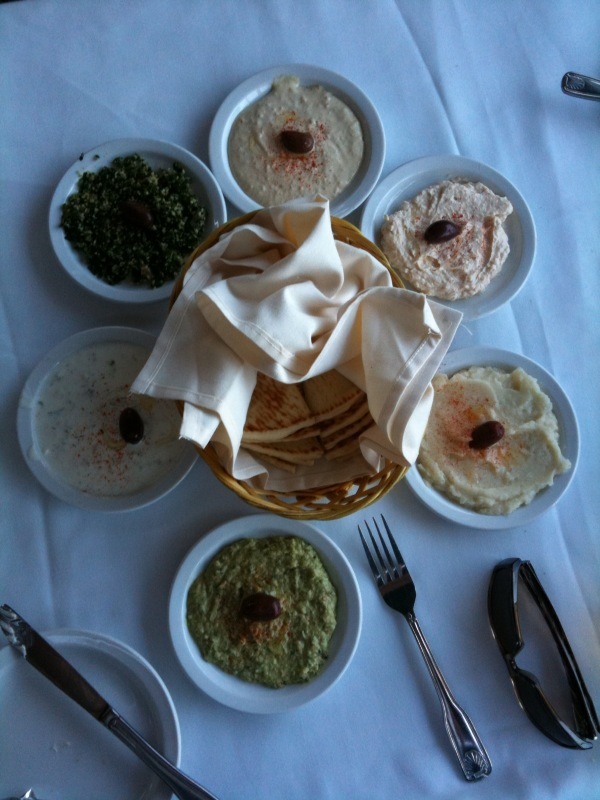 The first course came out and it was a basket of pita with six different dips. I’m not going to go into all of the dips in too much detail because there is enough writing there for a full post. Instead I’m going to assume you all have heard of Tzatziki and Hummus and move on to the more obscure dips. Both Mikey and I had a clear winner out of the six dips: the Taramosalata. It is made with creamed red caviar and was light and delicious. We also enjoyed the Skordalia, which was a potato and garlic dip that was really tangy. The other two dips were the Tabouli, which I found hard to get on the pita and the Melitzanosalata, which was made with eggplant and was probably my least favorite aside from the Tzatziki. Not that any of them were bad, I just don’t care for Tzatziki. The pita was amazing. It was fluffy and warm and grilled just enough. 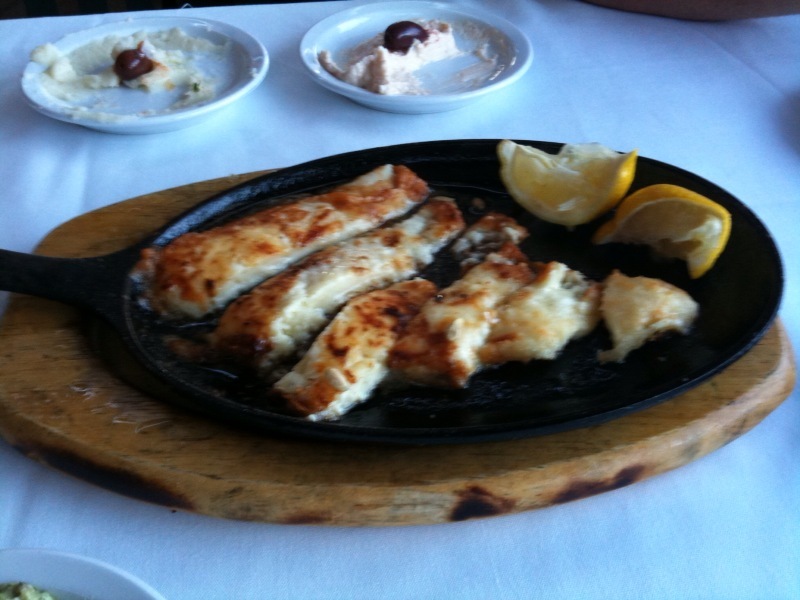 In fact, we ended up having them bring us more to go with our second dish, the Saganaki. Saganaki is a grilled goat cheese that is then flamed with 151 rum at the tableside. It was pungent and the flavor was intense. They also squeeze 1/2 a lemon over it to put out the flames. Mikey and I were both a little overwhelmed by the citrus in the dish and could probably gotten by on about half the amount. The citrus does do a good job of cutting the strength of the cheese though. It has a wonderful crispy texture on the outside that is a good contrast to the warm cheesey inside. The next dish was a Greek Salad. It had all the standard ingredients: olives, onion, bell pepper and feta cheese. It was probably the best Greek salad I’ve had. Granted, I’m not a big salad guy, but all of the produce was very fresh and the salad was not overdressed. After an extended wait (we later found out that they only had two cooks on) our main course arrived. It was a heaping plate of fried calamari, chicken kabobs over rice and lamb chops with a Macedonian garlic pasta. The calamari got a mixed review as I like the fact that it wasn’t too fried and the calamari wasn’t rubbery, but Mikey thought that it got soggy a little too quickly. It was probably because I ate it right when it hit the table, while Mikey dove into the other dishes first. We would have preferred to have the calamari a little earlier in the meal (perhaps with the Saganaki), that way, we wouldn’t have had to choose between crispy calamari and hot lamb chops. The one dish that didn’t really work for us was the chicken. We found it do be a bit on the dry side and the kabobs only had a couple small pieces of bell pepper and onion. The veggies were excellent. We just wished that there would have been more of them. Also, we found the rice to be slightly undercooked and some of the grains were a little hard when you bit into them. It wasn’t awful, but with all the food on the table we passed over most of the rice. The garlic pasta was the most overt garlic dish I’ve ever had in my life. That said, I enjoyed it immensely. The pasta was cooked well and the flavor was simple and powerful. The lamb chops were a bit of a mixed bag. We ordered them medium rare, but because they were sized differently, they came in every temperature from well to really rare. We both managed to score a perfect chop, which was juicy, tender and a joy to eat. The other ones, though, were either too tough or too bloody. Our final dish was the Baklava with a shot of Ouzo. For those of you who have never tried baklava, you’d better get some this instant. It is a pastry that is made of philo dough layered with a spiced almond filling. It is then sprinkled with powdered sugar and drenched in honey. It is both crispy and chewy, sticky and sweet and in my opinion, one of the best desserts out there. Coupled with a shot of the anise (black licorice) flavored ouzo, it was the perfect way to end a nice meal. Before I wrap up, I want to comment on a couple other reasons why you might want to check out The Greek. First, it’s a fun, friendly atmosphere with a lot going on. They have bellydancers and on the weekends you might catch the owner’s son Aris doing a “table dance” This is where he dances with a huge doubledecker table… in his mouth. It’s an impressive feat that everyone should see once. Also, The Greek isn’t just a place for special occasions. Their food is priced fairly and good quality. Mikey and I paid $33 dollars each for our 5 course meal, which legitimately could have served 3 or 4. The have a nice bar and a great selection of greek wines. I think I’ll be going back just to do the wine flights and get some more of that delicious pita. It is not the place to go when you’re in a hurry, but if you’re looking for a place to enjoy life by having a nice meal and enjoying the company of friends, then look no further than The Greek at the Harbor. And don’t forget the Opa!